in a carefully planned and unprecedented atrocity that shocked the usually peaceful nation. The attack was unleashed at lunchtime local time Friday when mosques were full of worshippers. Footage of the massacre was streamed live online, and a rambling manifesto laced with white supremacist references was published just before the shootings unfolded. Prime Minister Jacinda Ardern described the horror as a terrorist attack, saying it was perpetrated by suspects with “extremist views” that had no place in her country or the wider world. It was one of New Zealand‘s “darkest days,” she said in a press conference Friday. Authorities said that every law enforcement resource in the country was mobilized after the attack. Three people were arrested in connection with the shootings. A 28-year-old man was charged with murder and will appear in court Saturday morning local time. Two others were arrested on suspicion of possession of firearms. 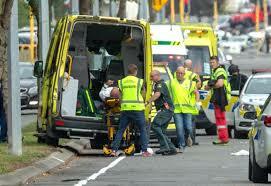 Police was investigating their ties to the incident, New Zealand Police Commissioner Mike Bush said. Australian Prime Minister Scott Morrison said that at least one of those arrested is Australian. The atrocity was the work of an “extremist right-wing, violent terrorist,” he said. Police were not searching for any other suspects in connection with the attack but stressed the investigation remained fluid. None of those arrested in connection with the attacks had been on any security watch lists prior to the attack. Authorities declined to discuss the potential motives behind the attack. anti-Muslim ideas and explanations for an attack. The manifesto was not signed. Police said they were aware of a video shared online and broadcast live during the attack, which apparently shows a gunman walking into a mosque and opening fire. “We would strongly urge that the (video) link not be shared. We are working to have any footage removed,” New Zealand police said. The brazen nature of the broadcast and the tech companies’ failure to prevent its proliferation online raised profound questions about the nature of internet radicalization.